Kaffe Magnum Opus really started as an aroma in 1955 or so, in an A and P store in East Rockaway, Long Island. Bob Johnson, the person who started Kaffe Magnum Opus was then only 10, but had the enviable task of grinding the coffee for his parents' home use. "I always remember the aroma", says Bob. "That aroma hit me again in the Galleria Mall in Philadelphia in 1989 and I decided there and then to change my life completely." After 23 years in finance, Bob followed the aroma into the coffee business and started Kaffe Magnum Opus in 1991, as an in-line store - Coffee Time - in the Cumberland Mall, Vineland, New Jersey. The Mall store was a combination drink bar, bean store and gift source. It was very successful and led to the opening of a cafe in downtown Vineland, where Coffee Time led an effort to revive the downtown. It was a full fledged cafe with entertainment. The cafe building became the Headquarters and roasting plant for Kaffe Magnum Opus in 1996 when Kaffe Magnum Opus emerged. In 2001, the roasting plant was moved to Millville, New Jersey into larger, more appropriate quarters. Kaffe Magnum Opus has been growing rapidly and plans to continue this pace by becoming the Roaster of Choice for the Specialty Coffee retailer and gourmet food stores. These retailers derive the benefit of using key features that put KMO to the forefront of the Specialty Coffee industry in both coffees and service. 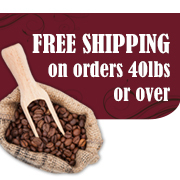 Freshness is king in the coffee business and Kaffe Magnum Opus only roasts to order. Even in its new facility with larger roasting equipment, the focus is on roasting batches. This insures freshness. Kaffe Magnum Opus is flexible and has changed many times to fit customer needs. It now has well over 250 flavors - and growing, 100 origins and blends and is intensifying efforts to market Fair Trade Organic coffee. If you would like to see how KMO coffees can add to your successful coffee program... Click Here.